Over the past week, there has been a contentious controversy percolating at Philadelphia’s City Hall. The calamity claiming so much of the city fathers’ attention during this busy holiday season turns out to be a commercial endeavor being held on city property, a holiday market featuring food, arts and crafts, and entertainment. So what could be so very wrong with such a charming event? In a word, it’s C-H-R-I-S-T-M-A-S.
Christmas Village in Philadelphia is an outdoor holiday market event at Dilworth Plaza on the west side of City Hall Philadelphia from Thanksgiving till Christmas Eve. Vendors in more than 80 wooden booths and a big tent which form a nice little village sell European food, sweets and drinks as well as international seasonal holiday gifts, ornaments and high quality arts and crafts. Thousands of lights at booths and trees integrate Dilworth Plaza into the scenery of the illuminated city hall. A central stage is the place for live performances of local choirs, orchestras and bands. Santa’s house and the official municipal Christmas tree including its tree lighting ceremony are great attractions for the whole family among many others. Christmas Village offers its visitors a unique opportunity for shopping and enjoying European specialties in a Christmassy atmosphere. The organizers of this Pennsylvania German inspired Christmas market received complaints from some city residents and city workers over the word ‘Christmas’ appearing in the sign at the village’s entrance. 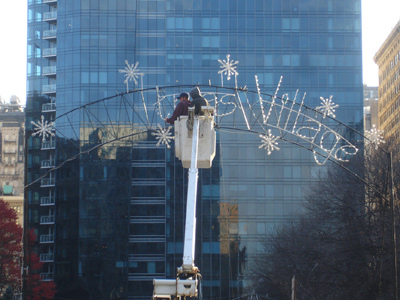 In response to the complaints, the city told the organizers that the word ‘Christmas’ had to go, and in its place, the progressively correct and culturally vacuous word ‘Holiday’ would be erected. As workers began pulling down the ‘Christmas’ curse word, the controversy turned into a full-fledged fight when news of this secular nonsense hit the national media. Result? Today, the mayor of Philadelphia, Michael Nutter, announced that the ‘Christmas’ spirit would be brought back to the Christmas Village market. The CHRISTMAS Village sign will once again appear over the entrance to the CHRISTMAS Village exhibit. One more skirmish in the War of the Words. One more defeat for the brainwashing bathos of the Heritage Deniers. This entry was posted in Political/Social and tagged Christmas Village, Heritage Deniers, holiday, Mayor Nutter, Philadelphia, sign, War on Christianity. Bookmark the permalink.